Who would have pegged two burly, bearded men in matching lumberjack shirts and suspenders as champions of femininity and womanhood? 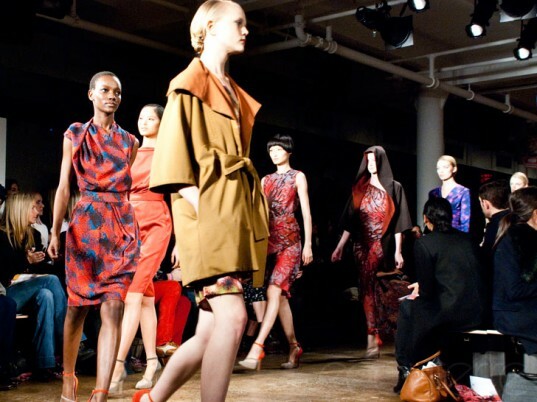 The world works in wonderful, mysterious ways, as do newlyweds Jeffrey Costello and Robert Tagliapietra, who unfurled their Fall/Winter 2012 collection at New York Fashion Week on Thursday. Decked in abstract chrysanthemum prints and complementary solids, the parade of frocks (and one mustard trench coat) swished down the runway in a technicolor explosion of amethyst, cobalt, and coral hues, courtesy of AirDye's water-saving digital printing technology. Costello and Tagliapietra’s kaleidoscopic prints have become as much a trademark as their coordinating outfits. And in this instance, they led the collection. “Jeffrey had been painting these beautiful water colors,” Tagliapietra explains. “We started layering them in Photoshop and throwing in different colors.” The result, Costello adds, took on a “Beetlejuicy, Dr. Seuss-ish” quality. Each Costello Tagliapietra dress dyed and printed with AirDye saves 45 gallons of water and 95 megajoules of energy. Among the captive audience? Actress Susan Saranadon, Top Chef host Padma Lakshmi (wearing Costello Tagliapietra, no less! ), and fashion blogger Bryanboy. Costello and Tagliapietra's kaleidoscopic prints have become as much a trademark as their coordinating outfits. And in this instance, they led the collection. "Jeffrey had been painting these beautiful water colors," Tagliapietra explains. "We started layering them in Photoshop and throwing in different colors." The result, Costello adds, took on a "Beetlejuicy, Dr. Seuss-ish" quality. Because the AirDye technology uses computers to manage the application of dye to the textiles, Costello and Tagliapietra were free to define subtle variations in hue and tone. "With this process, you get these great iridescent, almost heathered colors," Costello says. "You can't get that with standard printing." Each Costello Tagliapietra dress dyed and printed with AirDye saves 45 gallons of water, 95 megajoules of energy, and 3 kilograms of greenhouse gases, according to AirDye Solutions. It's a decision that makes perfect sense for the label. "You have to dye your fabric," Tagliapietra says, "so why not do it in an ecological way?" 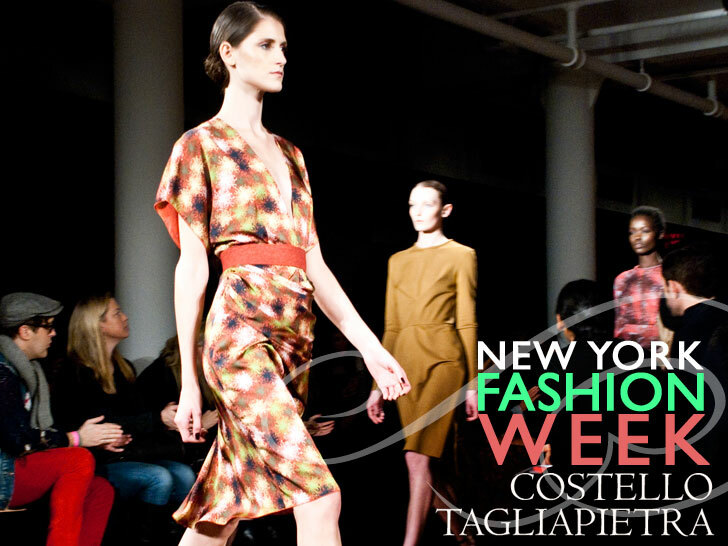 Costello and Tagliapietra are hard-pressed to describe what draws them to womenswear. "The obvious thing for us would be to do plaid shirts," Tagliapietra says. "You just do what you feel passionate about." Asked to describe their collection, Tagliapietra utters the words "beauty, romance, and femininity." "It's just beautiful," he adds. "We love beauty."